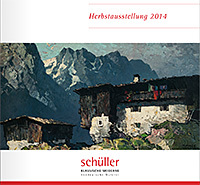 For more than 35 years Galerie Schüller has been showing alpine landscapes as part of Southern German painting. The monumental mountain views of Austrian artist Oskar Mulley (1891 - 1949) have long been part of the gallery's portfolio. The depth effect of his paintings allows the viewer to immerse themselves in dramatic mountain worlds with steep slopes, snowy mountain peaks and deserted mountain landscapes. The cool shades of blue and gray in Mulley's typical coarse filling technique convey the clashing cold of alpine winter in a particularly impressive way. The mountains also play a role in the oeuvre of the artist Arnold Balwé (1898 - 1983), but as a backdrop for his vast landscapes. Early on, the artist settles on Lake Chiemsee, where he finds his personal natural paradise, which is the subject of his numerous paintings. Balwé's artistic means of conjuring up a winter atmosphere are his expressive style, the cool fresh colors, the dry, impasto application of paint and the use of strong contrasts of light and shadow. 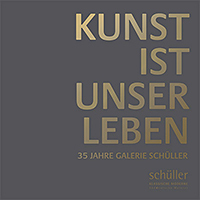 Come and let yourself be enchanted by our winter special showcase of these two artists at Galerie Schüller. View and order our exhibition catalogues. When we initially held the first watercolors by Karl Schmidt-Rottluff from the collection of Franz Zöllner in our hands, we felt great things. However, we had no idea what a significant gift from this collection would come to us: the two paintings Katholische Probsteikirche St. Patrokli, Soest and Dame mit Hut by Karl Schmidt-Rottluff. As the painter’s key works, they are an outstanding discovery in the 35-year history of our gallery. These two main works of the co-founder of the artist group Brücke come from an important German private collection. 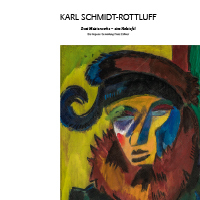 They are true jewels of an Expressionist collection, which grew out of a very intense and personal contact between the collector and the Brücke artists, including Karl Schmidt-Rottluff. The two oil paintings are now available on the art market for the first time, so they are fresh from the market and of unique museum quality and unique beauty. It is precisely this extraordinary position that makes them incomparable. All the more important to us was the scientific assessment of the paintings. The results of this well-founded examination of the works and the sources appear in an accompanying publication. Our exhibition will give you an exclusive insight into two unique paintings and two unique personalities – the artist and his collector. OSKAR MULLEY. A life in pictures. In his paintings Oskar Mulley questions human existence and its significance in the face of looming forces of nature. At the same time, the monumental works exude depth, calmness and power. In the artist's compositions, he sets high-altitude mountain villages, farms and chapels on the edge of steep precipices – generating the images’ unique drama. While being drawn into the depth of these works, the viewer is bathed in the mountain world, and the photography allows one into the life and surroundings of the artist. 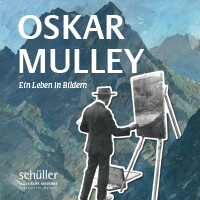 Photos of locations and moments from Mulley’s time at the Academy in Vienna, of Kufstein and his later years in Garmisch-Partenkirchen paint a picture of a self-aware person and painter. "What brought you to the art world?" 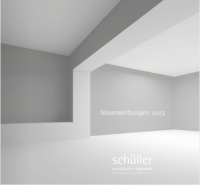 The question is one which Wolfgang Schüller, the founder of the gallery, is asked time and again. An anniversary seems like an ideal opportunity to answer it and the story of the genesis of the gallery is a very unusual one. 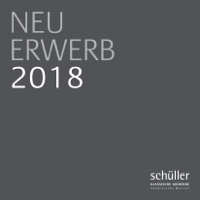 In our anniversary catalogue, Wolfgang Schüller speaks very personally about the past, the present and his vision for the future of our gallery. Our passion for art is what drives us to continually refill the 'treasure chest' of our gallery with high-value works of art of the best provenance. For this reason, our most recent acquisitions are at the heart of this anniversary exhibition, both in our physical gallery space and in our anniversary catalogue, in which you can read fascinating details about each work on display. We would be very happy to give you a personal tour of the exhibition in the gallery. We look forward to your visit! engraving and reverse glass painting. This vast range of artistic techniques serves to demonstrate the versatility of this highly experimental artist. The work of Max Lacher has a permanent place within the Munich cityscape. It is still seen on a daily basis by thousands of visitors and has, in recent years, experienced an increasing degree of public recognition; whether the decorative frescos of horses and riders in what was then the old central post-office, now the Munich's State Opera, or the facade of the famous Donisl pub in Marienplatz, or the stained glass window depicting images of the apocalypse in Munich's Frauenkirche cathedral. 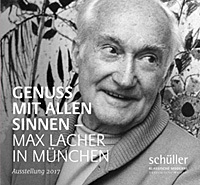 These are just a few of his many works that can be found in Munich's public spaces, and with which Max Lacher enriched the life of the city with heart, charm and humor. The works exhibited in this show include pieces on canvas, cardboard, paper and glass. They seem to have been made in order to transport the historic zeitgeist into our contemporary living spaces and to touch our senses in the here and now. 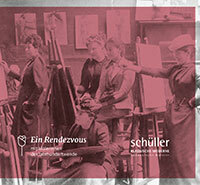 Around 1900 it was not possible for women to study at a European state art academy. Expensive private schools and private tutors represented the only possibility for gaining a fine art education. Generally female painters earned nothing but ridicule for their work and in public in Germany they were derisively termed 'Malweiber' (Painter Hags). Women required will, energy and unerring persistence in order to learn and practice the profession of artist. We can recognize these character traits in the biographies of Gabriele Münter, Paula Modersohn-Becker and Käthe Kollwitz. These painters are, despite their different modes of representation, exemplary witnesses of their age. The works of these female artists, presented in the gallery, point to the relationship between the situations in which they were living and their choices of subject matter. Visit our gallery and one of our resident art historians will gladly explain these connections. Zum 50. Todestag eines der bedeutendsten Koloristen des 20. Jahrhunderts rücken wir Werke des Malers in neues Licht. Wir spüren Zusammenhänge zu den großen Impressionisten wie Max Liebermann und Lovis Corinth auf ebenso wie zu Vertretern der Künstlervereinigung „Scholle“. 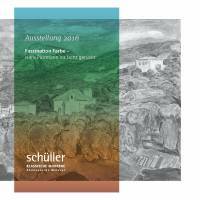 Herbstausstellung 2015 – Alles bleibt ganz anders. Nach dem Umbau zeigen wir die neuen Räumlichkeiten der Galerie und präsentieren die Neuerwerbungen. Die alpine Bergwelt Mulleys und Waldes wird der asiatisch inspirierten Bergwelt Werner Hahns gegenübergestellt. Das klassische Tafelbild der westlichen Welt wird mit dem Rollbild der östlichen Hemisphäre konfrontiert. 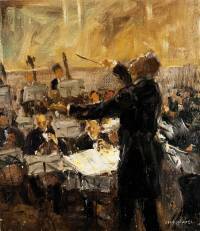 Ausstellung "Richard Strauss - Otto Pippels malerische Hommage an die Musik" und Neuerwerbungen der Galerie mit Werken von Marc Chagall, Franz Marc, Gabriele Münther, Paula Modersohn Becker u.a.m.